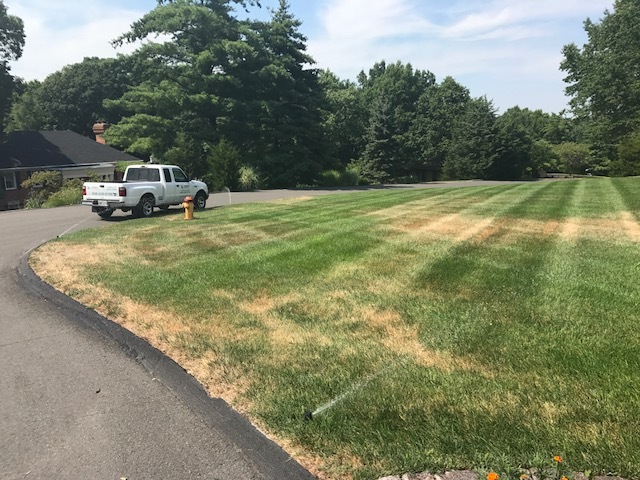 Is your lawn drying out in certain spots during the summer drought? During this bad stretch of hot weather & drought, consider watering every day. Water in the morning, not the middle of the day, to prevent fungus outbreaks. Look around for an irrigation coverage issue. Ideally we want zones to overlap with each other, and that may not be happening in some of the brown areas. In addition, any large trees, signs, or overgrown bushes could also be causing obstacles. Our irrigation department is here to help! In addition, our technicians are trained to offer smart water usage recommendations including water smart controllers, rain sensors and more! Dowco offers inspections at a discounted rate of $55 for the first hour of work (normally $99) as a reward for proactively monitoring your landscape. Click the link below to easily schedule your irrigation inspection online or call our office at (636) 532-9192!